At IDF ceremony Ya'alon says 'soldiers who aren't okay don't get backing,' and condemns those defending soldier who shot wounded terrorist. Defense Minister Moshe Ya'alon (Likud) took part in an IDF ceremony attended by the Chief of Staff Gadi Eizenkot, in which he spoke about the soldier who last Thursday shot a wounded terrorist. 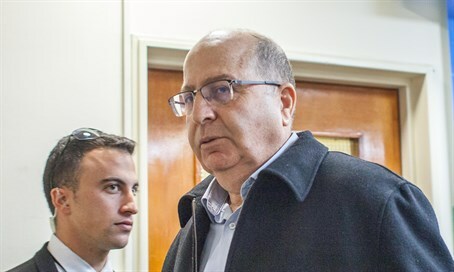 Ya'alon was among those who rushed to condemn the soldier, who was filmed by an Arab camerawoman of the radical leftist NGO B'Tselem shooting a terrorist in Hevron, who moments earlier had stabbed and wounded a soldier. The soldier has been arrested and is charged with murder. "In these days it is impossible not to talk about the current events," said Ya'alon during the ceremony. "We regularly speak about the storm around us, but there is a storm also at home in these days, which is not good for the army." He stated that every Jewish mother "who gives over her son and brings him to general service in the army can rely on all those who are here in the room, for good and for bad, as when he is okay he receives backing and when he is not okay he doesn't receive backing." The soldier's mother in fact wrote to Ya'alon on Saturday night, in a moving letter in which she reminded Ya'alon that when he was the commander of Sayeret Matkal he confirmed the killing of the terrorist Abu Jihad by shooting him after he was already shot. She noted the hypocrisy of Ya'alon's condemnation of her son. Defending his immediate condemnation of the soldier, Ya'alon said Monday that "part of the matter is to set the ethical and moral bounds, and when someones oversteps them in such a blatant manner as seen in an initial investigation in Hevron - then it is correct to say so in a very clear manner, so as to immediately highlight the matter." "That isn't connected to the process that will take place afterwards, beyond the command process that was resolved immediately after a clarification of the details." The soldier has argued he shot the terrorist over concerns he was about to detonate a bomb belt that was thought to be hidden under his unseasonable coat. Ya'alon said that criminal proceedings are currently being held against the soldier, "without us intervening and without us interfering." "But unfortunately as part of the Israeli experience, politics comes in as part of an attempt to influence the army," he said, in a hinted echo of his criticism against coalition members who gave the soldier backing. "One of the most important challenges is to stand as a 'protective edge' and navigate according to the conscience and not according to the direction the wind is blowing, not according to polls and not according to the harsh words of these or those sources, and in that respect I give full backing to the Chief of Staff who was personally attacked, and every one of you." A recent analysis found that 82% of Israelis taking part in the online conversation regarding the incident are supportive of the soldier.